The board then held an hour-long closed-door executive session to evaluate Blouin-Williams. She was there with her attorney Robert Jenkins, the prominent local defense attorney who represented former New Orleans Mayor Ray Nagin during his trial on federal corruption charges. After a closed-door session, the board voted unanimously to place her on paid leave during the investigation. The network’s executive team will serve as the interim leaders of the organization. District officials Amanda Aiken and Kelli Peterson were also present at the meeting. New Beginnings’ board attorney, Michelle Craig, a former Adams and Reese employee was not present. Runell King said at least 17 students in Algebra III moved from an F to a D. Blouin-Williams said grades were changed due to a calculation error in the school’s electronic gradebook. But King contends, if that were the case, all students in the questioned classes grades would have changed or at least shifted. That did not happen, he said. The algebra teacher left mid-year for personal reasons. King said he thinks that made her students a target for the grade inflation. Blouin-Williams has repeatedly refused to answer questions about why an indicator of a manual final grade change, a small red exclamation mark, appeared on some students grades and not others. King, who previously worked as the network’s director of data, assessment and accountability, was at the meeting. He had asked to be placed on the agenda, but board members ended the meeting without doing so. Gang, the board chairman, spoke with him afterwards. “We want to make sure we have the right information,” Gang said. King asked for a timeline, Gang said they didn’t have one yet. “I’m now questioning the practices of the organization,” he said, noting he was suspended without pay at two different times, while Blouin-Williams was being placed on paid leave. King reported his findings to New Beginnings administrators in February. New Beginnings, as well as the Orleans Parish school district, both initially said they conducted investigations and found no evidence of wrongdoing. King was fired last month. But in the weeks since the allegations have become public, both New Beginnings and the district have reopened their investigations. The Orleans Parish school district released a statement as the board went into executive session. 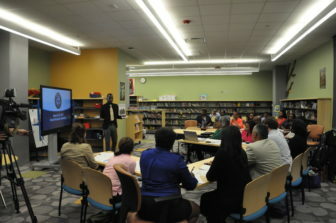 “As an authorizer of schools, the Orleans Parish School Board (OPSB) takes the integrity of education very seriously,” spokeswoman Dominique Ellis wrote. She provided more details about the district’s investigation. Ellis wrote “the OPSB received an allegation of wrongful grade changes regarding New Beginnings Schools Foundation” on March 1 and started an investigation that lasted two weeks. Scholars First is facing a criminal investigation for allegedly falsifying its insurance documents, following earlier reporting by Hammer. The original agenda emailed to reporters for the board’s Sept. 21, 2017 meeting did not list a “contract” item. But the current agenda on the network’s website does include that item. Meeting minutes don’t reflect any vote to add an item. But the minutes show a transportation contract with Scholar’s First was approved. Hammer reported audio of the meeting does not include a contract approval.